While visiting Sidecar one day, we noticed that a place called "Pie-Not" was going to open next door. Australian pies? What exactly does that mean? Once the doors opened though, eager pie eaters came in droves, constantly making the place sell out according to the social media we were following on them. We finally were able to visit one sunny Sunday to see what these authentic, gourmet Australian good were. Freshly made by hand daily? That sounds awesome. Locally sourced meats and produce? Even better. 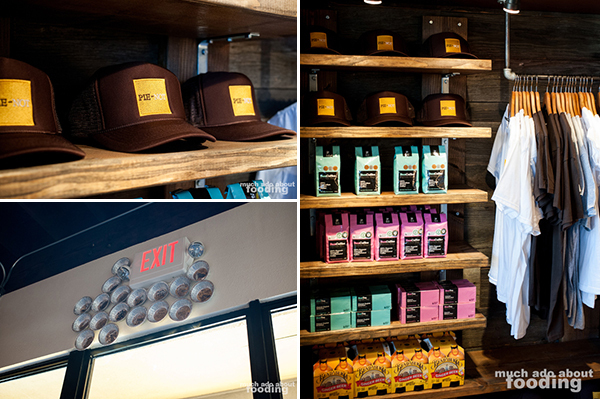 It was starting to look like another great addition to 17th Street in Costa Mesa even before we stepped inside. Once we stepped inside though, the decor struck us with admiration. It made more sense once we learned that co-founder/co-owner Jai Snowdon, originally from the Gold Coast of Australia, was a designer himself. Bold solid yellows accented the dark paneled wood, accompanied by the occasional bit of blue from coffee provider Bun Coffee. The red brick also gave a welcoming, hole-in-the-wall bakery feel but the clean-cut layout showed the thoughtfulness put into the laid-back, modern ambiance of the place. 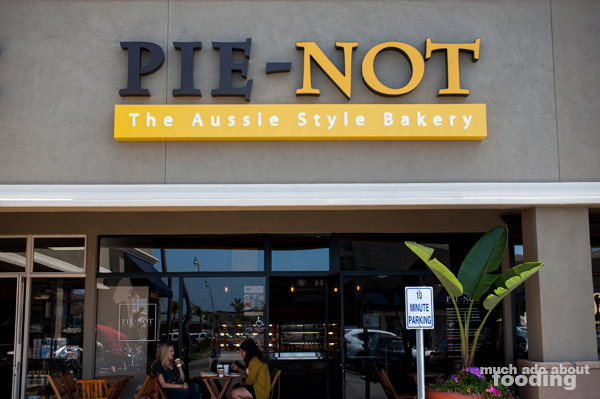 We touched base with the other founder/owner Ryan Lopiccolo of Newport Beach, CFO & Managing Director, while we were there to get acquainted with the Aussie-style bakery. 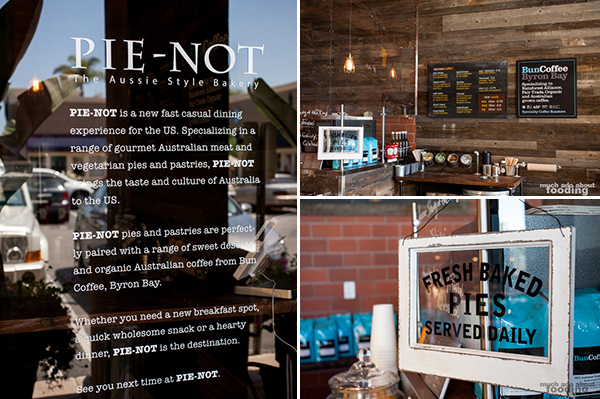 He was the "business" guy of the pair and told us about how the concept of Pie-Not had been in the works for a while having stemmed from a desire to bring Aussie-style pies to Orange County (he had lived there for a bit himself). It just so happened that they found themselves with the perfect chef not too long after going through their concept. Chef Samantha Boxer, originally from Melbourne, Australia, is the mastermind behind the perfection of the pies having incorporated her own talents with her heritage. With 26+ items on their menu, Pie-Not keeps her busily baking every day. 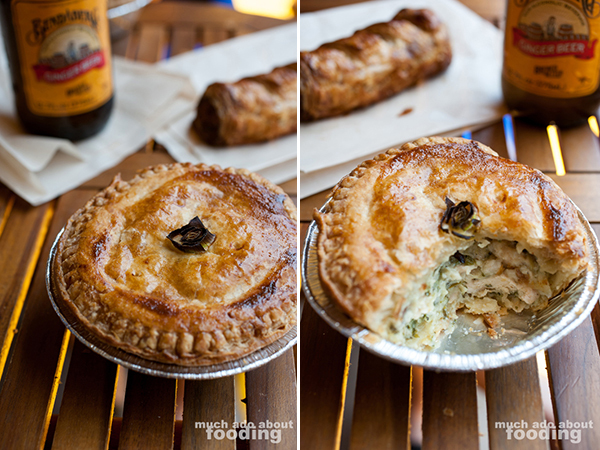 What is unique about these Aussie-style pies besides being quite savory (as opposed to our American perception of pies...such as apple, peach, banana creme, etc) is their carefully thought-out structure. These are meant to be eaten with your hands. As Ryan told us, these gourmet goodies in Australia are equivalent to our burgers in American - there are burgers and there are burgers; you eat them on the go, in the car, wherever, and there are marked differences in what makes a good one versus a mediocre one. I'd say that Chef Samantha plays a key role in making their goodness and portability a realization as her fillings sit in a shortcrust pastry shell (which clamp down with each bite to seal in the filling) before being covered by a flaky puff pastry. 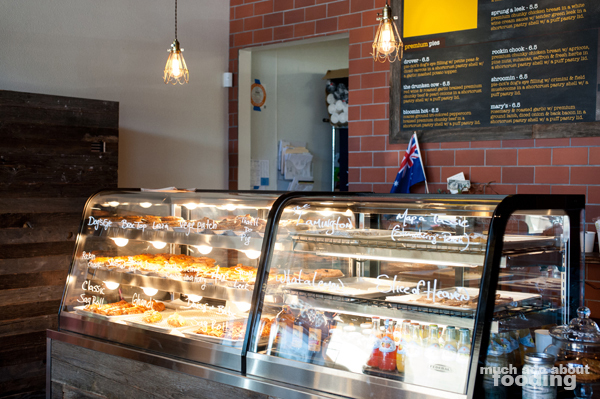 The menu consists of the classic Aussie “meat pie” (Dog's Eye) and the themed variations of it, premium varieties of a savory pie, sausage rolls, and desserts. Ones we didn't get to try from the meat pie selections were the Brekkie, Curry in a Hurry, Vege Patch, That'll Do Pig, Shroomin, Mary's, Blooming Hot, and Drover - all oh-so-tempting if not for the limited real estate in our stomachs. 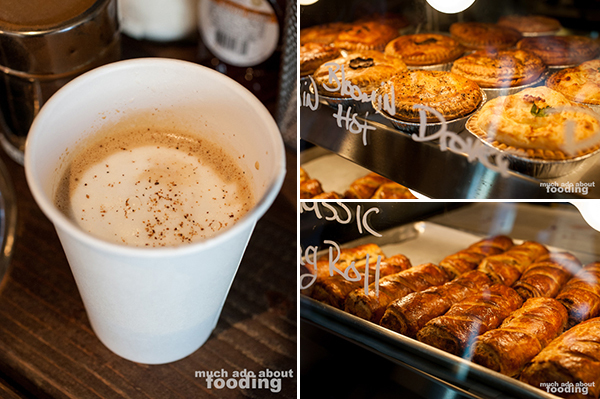 They also serve organic Australian coffee from Bun Coffee from Byron Bay, Australia. We got a taste of the "Dave Special" as suggested to us by Austin of Hungry Dogg, and man, was it tasty! Coffee with hazelnut, nutmeg, and magic was in that cup. Ask for it when you drop by. As we sipped, we looked above our heads to see celebrity signatures on the bottoms of pie tins stuck up on the wall. What a fun touch. 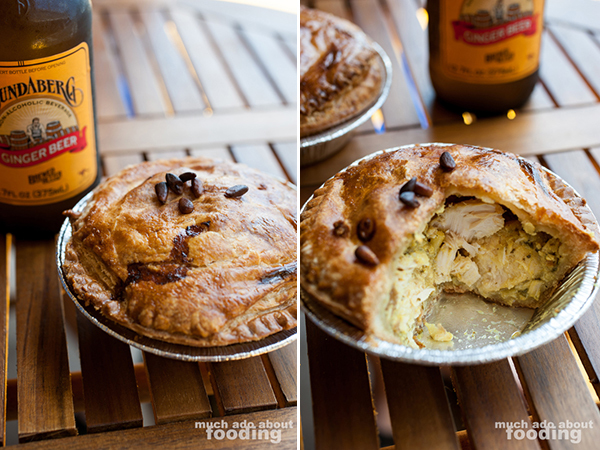 The first to come out was their Rocking Chook ($6.50 - premium chunky chicken breast with apricots, pine nuts, sultanas, saffron & fresh herbs in a shortcrust pastry shell with a puff pastry lid), a Moroccan-style premium pie designated by toasted pine nuts on top. This one was bursting with spices, mixing in savory with sweet - the apricots really highlighted the freshness well with the hefty chunks of chicken breast. 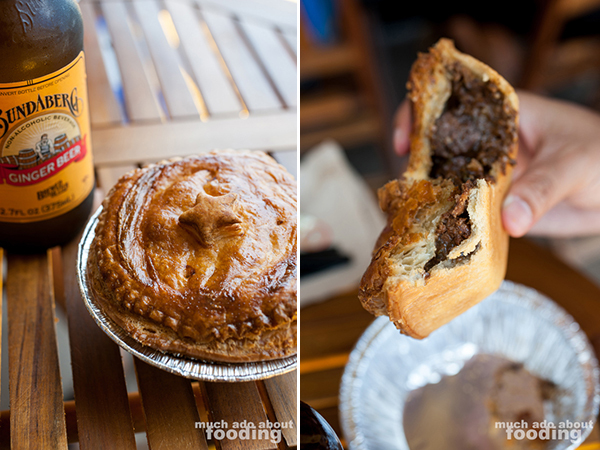 Our star-topped next pie was the The Drunken Cow ($6.50 - red wine and roasted garlic braised premium chunky beef and pearl onions in a shortcrust pastry shell with a puff pastry lid), one of Ryan's own favorites that he used to eat a lot while in Sydney. This is sure to fill you up with its rich flavors, dense filling, and overall meaty punch. The garlic shone through, greatly complemented by the pearl onions, and braised beef always goes well with red wine (think of beef burgundy between pastry!). 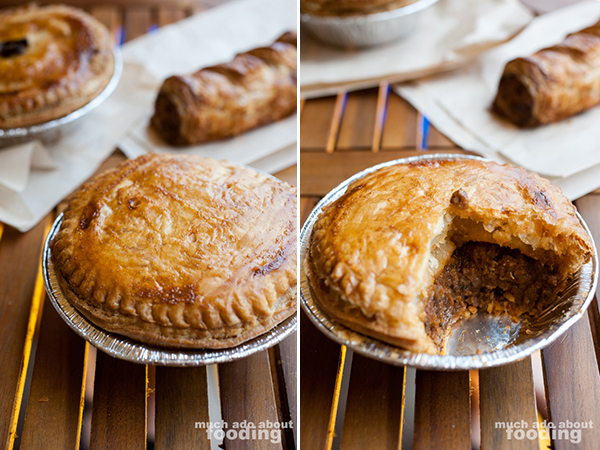 The classic Dog's Eye ($5.50 - the standard Aussie meat pie: premium ground beef with finely diced onions in a shortcrust pastry shell with a puff pastry lid) has us quivering the moment we smelled it at first slice. Okay yes we did slice into ours with fork and knife instead of biting down, handheld, like a true Aussie but it was for the sake of showing you all the amazing deliciousness that is the culinary creation of Chef Samantha. This one is a great one to begin with if you're new to the savory pie idea because it is the bare bones of a good meat pie. Try it - you won't regret it. If you're still needing to get used to the idea a little bit more, they have a chicken pot pie-like concoction called Sprung a Leek ($5.50 - premium chunky chicken breast in a white wine cream sauce with tender green leek in a shortcrust pastry shell with a puff pastry lid), one I knew Duc would love...and he did. The leek was plentiful as the cream was thick and rich. It gave a homestyle feel-good aftertaste with each bite and really seemed like something you ought to have when bedridden and sick. Try for this if you're more of the chicken fan. 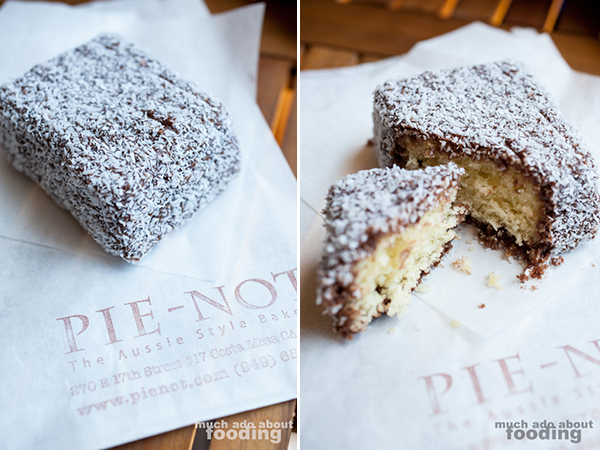 The last pair we had was the Sag Roll ($3.50 - standard Aussie sausage roll: premium ground beef and pork with finely grated onions and carrots rolled in puff pastry) and dessert The Lamington ($3.00 - traditional and unique Aussie dessert: butter sponge cake cubed and rolled in chocolate icing, dusted with desiccated coconut). 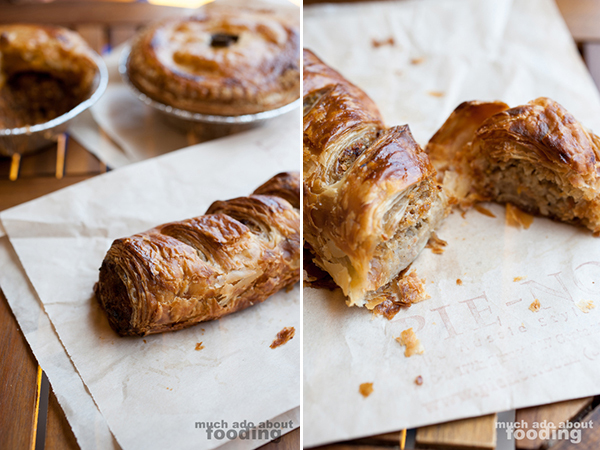 The roll truly made me think of pate chaud for the flaky puff pastry and the mix of ground meat. It was buttery, flaky-to-the-point-that-you-make-a-mess, and wholesome. As for the dessert, despite its decadent exterior, the cake was quite light. It was served cold which added to the airiness of the item. If you like coconut and chocolate, you should give this one a shot. Our thanks to everyone who had us there that day. If you're interested in checking them out, find them at 270 17th Street, Suite 17 Costa Mesa, CA 92627 and get your pie-eating on! I have eaten here 3 times now, each time in disguise of course, and each time the pie has been fantastic. I do think The Drunken Cow is my favorite but seriously, each was fantastic. So glad they brought this show to town! Pie-Not was GREAT! I'm glad I don't live closer because it could be dangerous...and my my my is the Drunken Cow tasty.